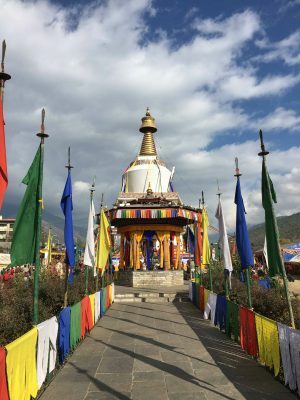 Kingdom of Bhutan, or The Land of Drukpa people (this is the official name of the country) is one of those unique, enchanting, mysterious places on Earth that you’ve heard so much about, that a visit… is simply a must. Even if you’re an ordinary, normal person, who considers and plans his/her trips with certain reason and certain budget, and not a crazy, obsessed global wanderer like myself. The area is 38,394 sq. km, slightly larger than the U.S. state of Maryland, or Montenegro in Europe. Рopulation is around 790 000 people — or roughly the same as Nottingham in the U.K. The country has no traffic lights! Smoking as well as tobacco products are illegal! All employees must wear traditional clothing (gho robe for men, kira dress for women) during work hours. In short, do visit. It’s totally worth it. 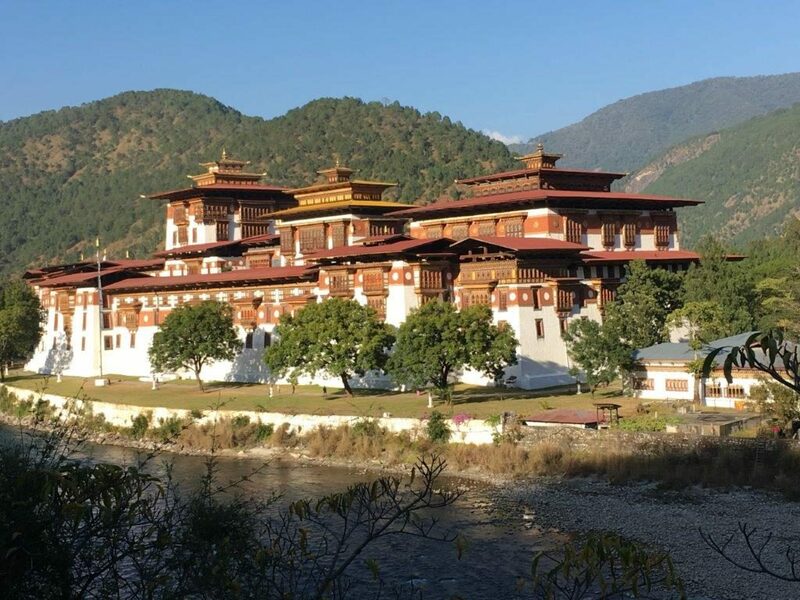 Full of picturesque monasteries and temples, truly stunning nature, and friendly people, Bhutan displays the best features of the harmonious and peaceful spirit of Buddhism. Ruled by the King of Bhutan or the Dragon King (any fans of Game of Thrones reading that? ), the country was never greedy for money and to this day strictly controls the number of visiting tourists – in order not to allow foreigners to interfere with pristine local nature and authentic culture. You’re welcome to drop by, but only in reasonable numbers. And as long as you spend certain amount thru licensed local tour operators. Yet the number of tourists gradually increased since 2012 and in 2016 it was up 24% to 54 600 per year. Now I am one more of these friendly intruders. The primary focus on peace of mind in Bhutan is reflected even in law. The National Assembly, with 47 elected members, cares mostly about “issues that affect the security and well-being of the country” and promoting “the welfare and happiness of the people”. 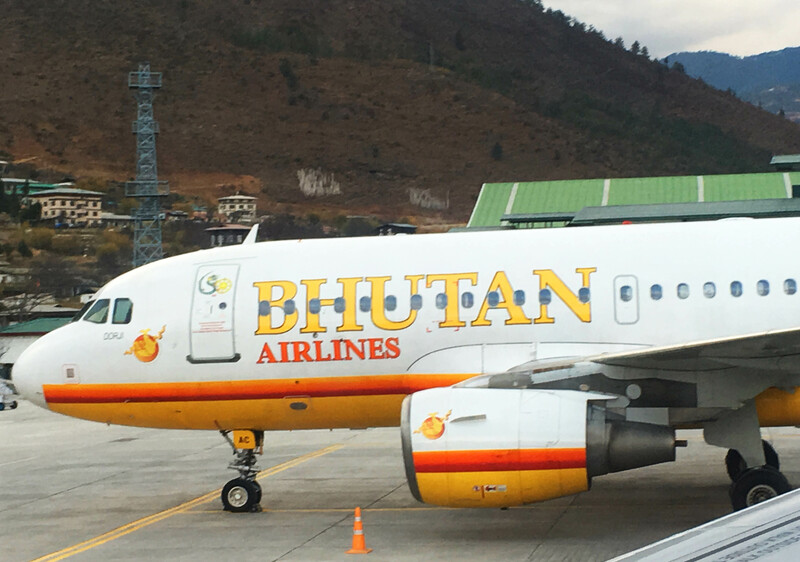 Tucked in the mountainous terrain between gigantic states as China and India, and although seemingly defenceless, Bhutan was never colonized. Probable explanations are the lack of strategic importance or mineral resources, although the country is rich in hydro energy. Anyway, Bhutan managed to maintain its peaceful existence between powerful neighbours, forging a centuries-old friendship with India. To this day both Bhutan and Indian army guard the northern border and popular mantra says that “India helps protecting Bhutan in order to protect India herself, directly or indirectly”. Well, you can’t go to Bhutan or talk about it without mentioning the Takin. Local legend tells that the Bhutanese national animal was created from… the remains of a lunch eaten by Lama Drukpa Kunley, a 15th-century Buddhist saint, known also as the Divine Madman. He combined the skeletons of a cow and goat and brought them back to life with a… loud belch. 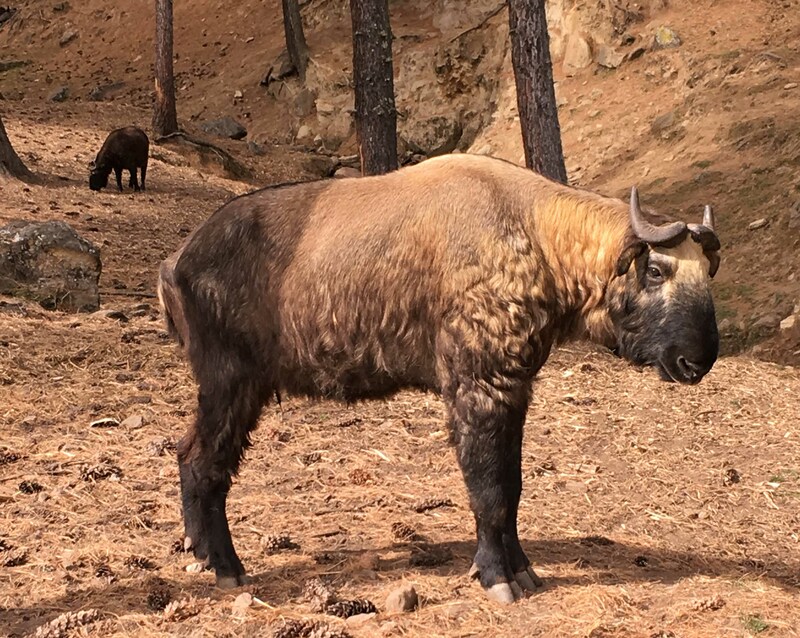 The takin is called a “goat antelope” or a “gnu goat”, but it also resembles moose and musk ox, but it actually is more closely related to wild sheep. And definitely – a brother-in-law of the bison. It’s a huge (up to 350 kg) hoofed and horned mammal, and the funniest description I’ve read was by blogger Matthew L. Miller, who wrote: “It looks like a creature Luke Skywalker might ride en route to saving the galaxy.” Lol. 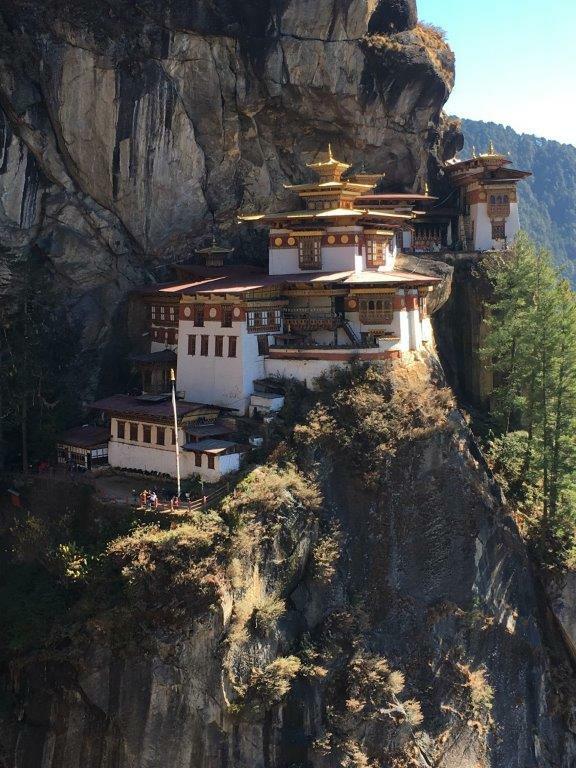 The steep ravines and rocky peaks hide beautiful monasteries that often look more like a fortress, and leave you wondering what superhuman effort was required to bring the stones and building materials so high and construct such an amazing thing, nestled on the cliffs. Monasteries are inhabited by active monks, who, when not in prayer or meditation or chores, are often playing board games, sharing stories, laughing, in other words – sharing the same happy attitude towards life as their secular compatriots. A wonderful object for photgraphy, and a prime example of the spiritual depth of Budhism and soul relaxation, the monasteries are a must-see. Probably the most dramatically placed, and the most photogenic is the Tiger’s Nest Monastery (also known as Paro Taktsang, or the Temple of the Guru with Eight Names) near Paro. Either relatively small, it’s miraculously “glued” to the steep cliff and its legend tells that right there “The Second Buddha” have meditated. Among the most exotic places that you can’t afford to miss, without a doubt, is the Temple of the Divine Madman. He is a popular character in Tibetan Buddhism folklore, and the temple, Chimi Lhakhang (translated to mean “Temple of the Divine Madman”) was built in his honour. The temple is believed to bless couples who seek fertility and it is frequently visited by couples without children. The fertility ritual involves a lama, who places two phalluses, one wooden and one made of bone, on the couple’s foreheads along with an archery bow that belonged to the Divine Madman himself. He then says a prayer and offers the couple a stack of names for them to randomly draw from. Their selection dictates the baby’s gender and name. During my stay there I had a rare chance to witness a real national crisis, as dramatic as it gets in Bhutan. The reason? Unusually weak harvest lead to a fatal shortage of… chili peppers! A deep culinary drama for a country, which traditional national dish, Ema Datshi, consists mostly of chilis and sort of melted yellow cream cheese. Imagine what it would be if USA ran out of beef patties, or Italy – of pasta! Well, thankfully, problem was partially solved by importing peppers from Bangladesh, but the sensitive local palates deemed Bangladeshi product to be inferior in eco/bio grade… Don’t say! Trust him, if you don’t trust me. Yet.